Source: Compiled by Homecoming II Project 01 May 1990 from one or more of the following: raw data from U.S. Government agency sources, correspondence with POW/MIA families, published sources, interviews. Updated by the P.O.W. NETWORK 1998.
impending strike by other craft. Alarmingly, evidence continues to mount that Americans were left as prisoners in Southeast Asia and continue to be held today. Unlike "MIAs" from other wars, most of the nearly 2500 Americans who remain missing in Southeast Asia can be accounted for. Many U.S. Government officials have said it is their belief that Americans are being held, but have not yet found the formula that would bring them home. Detractors claim that not enough is being done to bring these men home. Stuart M. Andrews was promoted to the rank of Colonel and John F. Conlon III was promoted to the rank of Major during the period they were maintained missing. he Defense POW/Missing Personnel Office (DPMO) announced today that a U.S. Air Force officer missing in action from the Vietnam War has been identified and is being returned to his family for burial with full military honors. 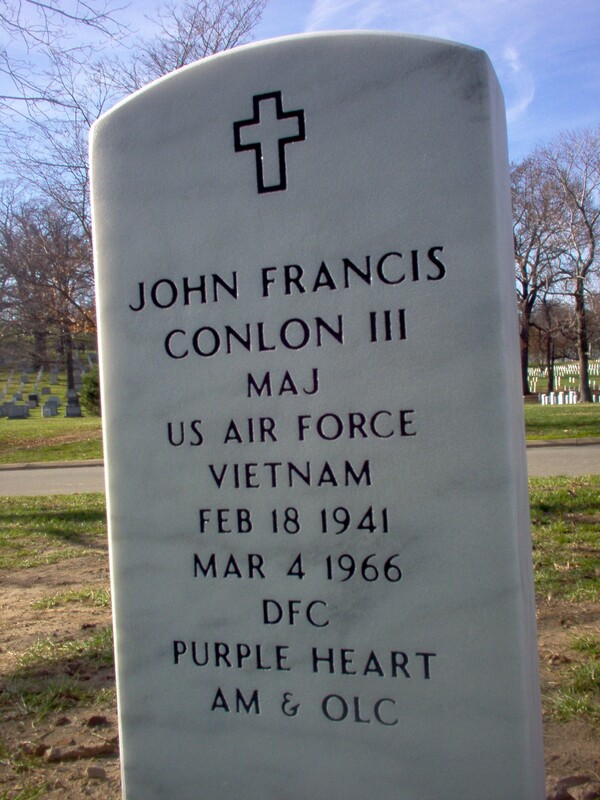 He is Major John F. Conlon III, Wilkes-Barre, Pennsylvania. His funeral is tentatively scheduled for Arlington National Cemetery near Washington, D.C., in the fall. On March 4, 1966 Conlon and another crewmember took off from Qui Nhon Air Field, Binh Dinh Province, South Vietnam, in their O-1E Bird Dog light observation aircraft. They were on a visual reconnaissance mission to Cheo Reo, an airstrip approximately 60 miles southwest of Qui Nhon. The last radio contact with the crew was with a U.S. Special Forces Camp about 30 minutes after take-off. The crew reported the aircraft's position but made no mention of problems. When the aircraft failed to arrive at Cheo Reo, a search and rescue effort was initiated, but failed to find the aircraft or crew after six days of searching. Between May of 1993 and August of 2005 teams from the Joint POW/MIA Accounting Command (JPAC) conducted six investigations in the Binh Dinh Province. They developed leads which took them to a site which was later scheduled for excavation. In February of 2006 a joint JPAC-Vietnamese team excavated that site and found aircraft debris, personal effects, human remains and a dog tag that related to Conlon's crew. JPAC scientists used Conlon's dental records to confirm his identity from those remains excavated at the site. Of those Americans unaccounted-for from all conflicts, 1,803 are from the Vietnam War. For additional information on the Defense Department's mission to account for missing Americans, visit the DPMO web site at http://www.dtic.mil/dpmo [http://www.dtic.mil/dpmo] or call (703)-699-1169. A Montgomery, Alabama, woman whose husband's military ID was recovered from a shallow grave in Vietnam after 40 years said she's relieved to know he had not been captured and tortured during the war. "After so many years, I had no hope that he was still alive," Ann Andrews said. The Defense Department in May informed her that Air Force Major Stuart M. Andrews and a co-pilot apparently were buried by villagers after a plane crash. Andrews, 37, took off from Qui Nhon Air Field in South Vietnam's Binh Dinh Province on a reconnaissance flight in a Cessna O-1E Bird Dog on March 4, 1966, flying with First Lieutenant John Conlon. They never returned. Despite a lack of remains, Andrews was buried at Arlington National Cemetery on June 13, 1978, and that same year, his name joined a list of 33 Yale University graduates on a memorial tablet at the university, honoring those who died in the Vietnam War. The pilot's family anguished for years about how he died. "You'd hear stories about people who were captured and tortured, and you'd just pray that nothing like that could have happened. Knowing that it hadn't, that it had been quick, was a relief," Ann Andrews told the Montgomery Advertiser for a story Friday. Claire Evans, Conlon's sister who lives in Dallas, Pennsylvania, agreed. "That was the worst part of not knowing - not knowing how they died, whether they'd spent years as POWs or been tortured," she said. The grave was discovered after military officials followed up on a tip in August 2005 from a villager in the Gia Lai province about a plane crash. On February 6, 2006, investigators from the Hawaii-based Joint POW/MIA Accounting Command began an archaeological dig after hearing reports of villagers burying two men from the crash. They found a metal military ID bearing the name Stuart M. Andrews. Because the grave was shallow and dug in what the report called "an erosion area," searchers found only four teeth, but an expert at Hickam Air Force Base in Hawaii was able to identify them as Conlon's. Evans plans to bury her brother's remains next month at Arlington. She's doing it for her children, she said, one of whom is named John Conlon Evans after her brother, and for their children. "When I got the news, I found myself thinking this is awful," she said. "But it isn't because at least now there is closure, and in my heart, I have the feeling that they have finally come home." Claire Evans just had to take out the soil and hold it in her hand. The Wilkes-Barre woman could not help but wonder was there something of her brother left in the specks of dirt. The residue of Vietnam was caked around a fragment of the military belt buckle Air Force First Lieutenant John Conlon III was wearing when he died. 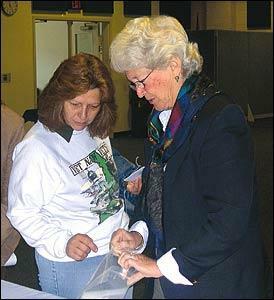 "It was the only thing I had to hold onto," said Evans as she recalled the bittersweet memory of opening the sealed plastic bag containing the soil. Investigators excavating the burial site just outside Dak Pling village were only able to find four teeth, eyeglass frames and two emblems from a Colt handgun belonging to her brother. Evans shared her story of closure Thursday at the annual POW/MIA recognition program at the Naval Support Activity in Hampden Township. Each year base employees and visitors come together to salute those unaccounted for. Evans was thankful knowing the country still embraces the philosophy of no man left behind. "It is bittersweet but better this way," she told reporters. There was always worry that Conlon was suffering as a prisoner of war somewhere, Evans said. She was relieved to learn her brother died quickly after his plane was shot down in flames. She achieved a sense of closure denied her family. Her father died in 1978 followed by her mother in 1989 and her sister in 1994. With relief came a dreadful feeling of loneliness knowing she is the sole survivor. She first learned his remains have been found in June. Evans recalls picking up the phone and hearing a voice say "United States Air Force, Department of Mortuary." Her body shaking, Evans tried to steady her hand as she wrote down information she longed but dreaded to hear. "Your brother’s crash site has been found; we’ve made a positive ID." Conlon was 25, single and fresh out of college when he decided to enlist in the Air Force in 1964, said Michael Randazzo, base public affairs officer and guest speaker at the ceremony. Always fond of planes, Conlon was determined to be a military aviator even though he knew he would be sent to Vietnam, Rendazzo said. "His parents were crushed, but they accepted his decision because John was a true patriot and felt it was his duty to serve his country." While training, Conlon became the first pilot in his class to fly solo in the T-38 Talon, the world’s first supersonic jet trainer. Four months into his tour of duty in Vietnam, Conlon boarded a Cessna "Bird Dog" observation plane piloted by Maj. Stuart M. Andrews, Rendazzo said. Conlon volunteered for the reconnaissance mission to get additional training in a plane smaller than the F-4C Phantom bombers he normally flew. Andrews and Conlon departed Qui Nhon airfield at 3:20 p.m. March 4, 1966. Twenty minutes later, they made radio contact with a Special Forces camp in the area. They were asked to check campfires that had been spotted, Rendazzo said. "That radio contact was the last word anyone heard of Andrews and Conlon." Two hours later, the plane was declared missing, but nothing turned up after an extensive air and ground search over the next six days. At first, the Conlon family held out hope John would be found alive, but that all but vanished in 1973 when the bulk of POWs held by the Vietnamese were released, Rendazzo said. Two years later, the family gave up hope when the Air Force officially changed his status from missing to presumed killed in action. Evans, meanwhile, joined a national POW/MIA group and kept herself informed of developments in the search for her brother’s remains. The first break in the case came in May 1993, when a search team from Joint POW/MIA Accounting Command interviewed a villager who saw a plane crash in the Gia Lai province around 1967 or 1968. Three years later, another search team interviewed villagers who recalled going to the site of a downed plane and burying the bodies of two aviators. A search of the area turned up Andrew’s dog tag and, with the help of elderly Vietnamese, a team began excavating the site on Feb. 16, 2006, on what would have been John’s 65th birthday. The team sent the teeth to a lab at Hickam Air Force Base, Hawaii, which identified John’s remains 40 years, two months and 22 days after he disappeared. His remains will travel to Arlington National Cemetery for burial with full military honors October 3, 2006. Robin Piacine of Silver Spring Township is active in the Coalition of Families of Korean and Cold War POW/MIAs. Her uncle, William Charles Bradley, is still unaccounted for. Piacine said the Conlon case is an example of how important it is for families to provide DNA samples to verify the identity of remains. Evans remembers her brother as a quiet, reserved man who loved the outdoors. "He was very artistic. He did a lot of painting ... mostly of planes." Among the mementos Conlon left behind was an oil painting of a seascape he painted for his sister when he was 16. Evans was surprised to learn how cooperative the Vietnamese were in helping the search team track down the burial site. "They had marked the trees." She reminded the audience there are still 800 American serviceman missing in action from Vietnam. "We have got to go and find them." For 40 years he lay in the dense jungle in Southeast Asia, an unknown soldier who had been afforded a crude burial by Vietnamese villagers. There had been no honor guard, no rifle salute for U.S. Air Force Major John F. Conlon III on that day in March 1966, when his remains were pulled from the burning wreckage of his plane in the Dak Pling Village of Vietnam. On Tuesday, thousands of miles away, the highly decorated Dallas native was finally afforded the military funeral he had earned for his sacrifice. Conlon’s sister, Claire Evans, and more than 100 family members and friends joined together at Arlington National Cemetery to say goodbye to the dashing young man who lost his life at age 25. An Air Force band trumpeted “The Battle Hymn of the Republic” as Evans led the procession that followed behind a horse-drawn caisson that carried the flag-draped casket. Inside the 16-gauge steel casket lay a full-dress Air Force uniform and medals Conlon had earned, as well as the only remains that were recovered -- four teeth. Conlon, who was promoted posthumously from Lieutenant to Major, was afforded full military honors that included a flyover by four F-10 Warthog attack planes, a color guard, gun salute and the playing of “Taps.” The sun shone brightly as a cool breeze rustled the yellowing leaves of the two sugar maple trees between which the fallen solider would be interred. Seated at the gravesite, Evans listened intently as the Rev. Tim Friedrichsen of Catholic University in Washington, D.C., presided over the service. Shots from an eight-man rifle squad pierced the silence just before members of the honor guard ritualistically removed and folded the flag from the casket and presented it to Evans. Her niece by her side, Evans arose and laid an array of white roses atop the casket, then kissed her hand and touched the top one final time. For Evans, 71, of Dallas, the day was the culmination of an amazing series of events that began on Feb. 16, 2006, when the Joint POW/MIA Operating Command, responsible for locating veterans’ remains, began a nearly month-long excavation in Dak Pling Village. The command had targeted that area, believing it was the site of a different aircraft that went down in 1971. Searchers did not realize they had discovered Conlon’s crash site until they came upon the dog tag of the fellow aviator killed with Conlon, Colonel Stuart M. Andrews. Conlon and Andrews, the pilot, were about 30 minutes into a mission in the Binh Dinh province of South Vietnam when radio contact was lost on March 4, 1966. Officials suspect their plane, a low-flying O-1E Bird Dog, was shot down. Conlon’s remains were positively identified in June. Since then, Evans has ridden a roller coaster of emotions as friends, family and strangers who had worn Conlon’s POW/MIA bracelet for decades contacted her. Speaking at a gathering of friends after the funeral, Evans said she was deeply touched by the outpouring of support she has received. Friends of her brother and family came from all over the country to attend Tuesday’s services, including one former classmate of John’s who traveled from Seattle, Wash.
With his burial at Arlington, Conlon joins more than 300,000 other service members who lie in rest at the nation’s most prestigious military cemetery. His gravesite will remain unmarked for about two months while the tombstone is inscribed with his name, rank, service affiliation, date of birth and death and information on the war he served in and the medals he earned. For the time being, he will be known only as lot 7487 in section 66. But Evans doesn’t mind. She had all but given up hope that her brother’s remains would ever be found. Today she’s just thankful; that unknown solider from the forest of Dak Pling Village is unknown no more. His name is Maj. John F. Conlon III, and he has finally come home.